The Kevin & Audrey Team is defined by our relationship approach to helping you with your real estate needs. Our focus is to inform you about the real estate process and market, so when you are ready, you can make an educated decision. Our team is committed to putting your needs before our own. Our passion in this business provides you with the information, guidance, and resources you need to make informed decisions. Whether you are a buyer, seller, or a seasoned investor our goal is to make every transaction as seamless and trouble-free as possible. We share a commitment to excellence, undergo extensive training, to ensure a continued quality of service. Our client first approach to real estate has transformed the typical real estate transaction into long-term relationships that provide us with unique insights into the Jefferson City market and ongoing resources for real estate opportunities. We invite you to experience a new experience in real estate, personal service, & attention to every detail. We have a commitment to openness, integrity, teamwork, and outstanding performance in every aspect of our business practice. We look forward to visiting with you! Kevin, Audrey, & Kris. 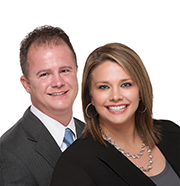 Audrey and Kevin are the epitome of excellence in real estate! From start to finish, they made the house selling and buying process a breeze. For us, the reason the experience was as positive as it was revolved around trust. When everything started happening so quickly (which was awesome! ), it would have been easy to become overwhelmed, but knowing that we were in the hands of the experts, we trusted that Audrey and Kevin would lead us through the process. They did not disappoint! As realtors and people, they cannot be beat. They're trustworthy, professional and extremely talented!